Like the 40-plus million family caregivers in the U.S., so many of us are caught off guard by the challenges of senior care and must suddenly adjust to a new normal. I became one of the nearly half of American adults in their 40s and 50s who are in the Sandwich Generation -- caring for a child and an aging parent, not to mention having a full-time job. The number of family caregivers getting squeezed from both ends will only grow. By 2050, the amount of people over 65 is projected to be 83.7 million (nearly double the rate now). Are we ready for this -- both emotionally AND financially? Care.com recently found that we, in fact, are not. In fact, Care.com's Senior Care Survey revealed that 64 percent of family caregivers are not budgeting or saving for their own senior care -- a potentially hefty expense if you need long-term care. It's a subject many of us choose to avoid -- often at our own peril. Is talking about the needs of our aging parents so uncomfortable? You bet it is. Topics such as money, health status, end-of-life care, and driving can trigger emotional land-mines. How do we deal with this distress? We may walk on eggshells, tiptoe around the issues, or ignore them altogether. But that only makes things worse when you get the dreaded call and a crisis erupts. And can we remind you that the population of those over 65 will double by 2050? What will this mean for us going forward? We can only hope that families, workplaces and the government are listening and stepping up to prepare for this global care crisis. When it comes to senior care, you should hope for the best, but think like a pessimist and plan for the worst. So here's what I have learned about the new normal of caregiving -- both from my own experiences and the hundreds of families who shared their stories with me. Be proactive with the family conversation. According to the Care.com 2016 Senior Care Survey, only 52 percent of those surveyed have discussed senior care issues with their parent(s) or aging loved ones. But once they actually tackle this difficult conversation, people ultimately feel informed (33 percent), hopeful (32 percent) and relieved (24 percent). 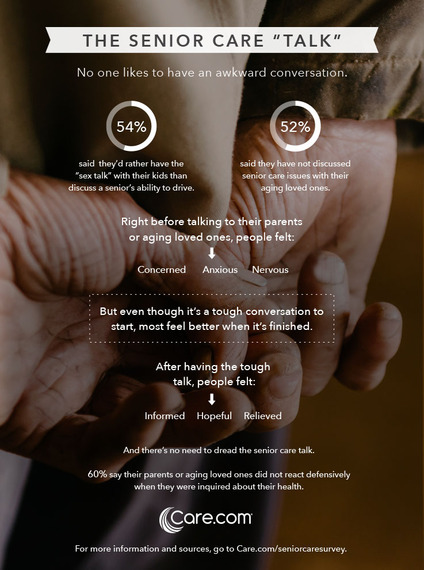 By proactively communicating preferences and expectations, families are in a better place to make informed decisions about the care of a loved one. Whether it's finding professionals to help you understand your options, or researching information online, there are a myriad of resources available to help families initiate this sensitive, and, oftentimes, confusing topic. Sadly, your parents won't need your help forever. During the months or years that they do require support, it's important to stay grounded in the present while anticipating and planning for their care needs down the road. If you're running around like a chicken with your head cut off trying to sort out finances and research care options, you'll tire yourself out and have difficulty juggling it all. Getting support and information early on can help you navigate the twists and turns along this unpredictable life journey and keep you focused on what really matters -- being there for your loved one.